Take me to the latest auction fundraiser! Click the "DONATE" button to the right and complete your donation! Please email us if you want a tax to receive an official tax receipt and we will be more than happy to accommodate. ​Monthly Donation? ​Please use the #Donate Now button. ​Hashtag (#) donations allow you to donate without leaving social media. Simply write #donate on any Facebook post or when you tweet at any of our partner charities. If you're not signed up, you’ll receive a link to complete a one-time registration. It really is that simple. You can also #donate on Twitter! Monthly Donation? If you like to make a recurring donation, you can do that using this #Donate Now button. 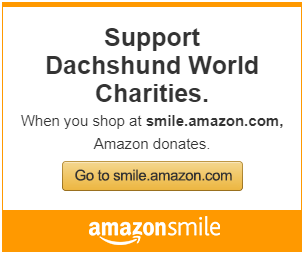 ​Dachshund World Charities is a team of caring animal lovers and dachshund owners. We are sensitive to the fact that it takes more than love to save a life, and all animals deserve a chance. We financially assist, to the best of our ability, sick or injured dachshunds, or their friends, who have a good prognosis for a healthy life, but whose owners are at a financial loss. We will also help you, the owner, if you have fallen on financial hardship and need funds to help with food and general veterinary care for your dachshund. Our goal is to help make difficult decisions come from your heart, not from your wallet. No one should ever have to choose between medical care, re-homing or euthanasia of their beloved pet. Although we, and many vet-care professionals urge pet owners to have pet health insurance, it is not always an affordable option, especially for those already suffering a financial hardship. When there is a situation where the pet or found animal has a good chance of being well but the owner or Good Samaritan can't afford it, Dachshund World Charities promises, to the best of our abilities help to cover as much as the cost as we can. If the owner has gone through their own resources; applied for and denied credit, such as "Care Credit", in the US and PetCard.ca in Canada; DWC asks the recipient to complete a form with their veterinarian to provide us with an estimated cost of the medical care necessary. Because we also love animals and know how much your pet means to you, we wish we could assist everyone with their bill in full, but it may not always be possible.